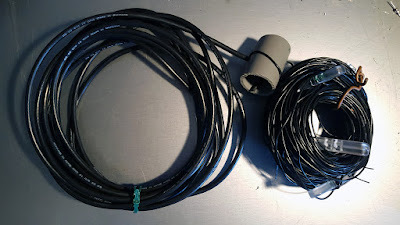 Always looking for better antennas to use when portable, I stumbled upon the 40m delta loop. I had read about it a couple of times but mainly from expeditions using the delta loop on higher bands near to salt water. The results were very good but could not be reproduced on "regular ground". So I made a mental note to look into the antenna more later but without high expectations. Then I came across an article by DJ0IP, who describes the delta loop on 40m as his favourite 40m DX antenna. Now that got my attention. Richard describes the loop and how to build it in detail. He opted for an antenna feed that makes this antenna vertically polarised with a low take off angle. 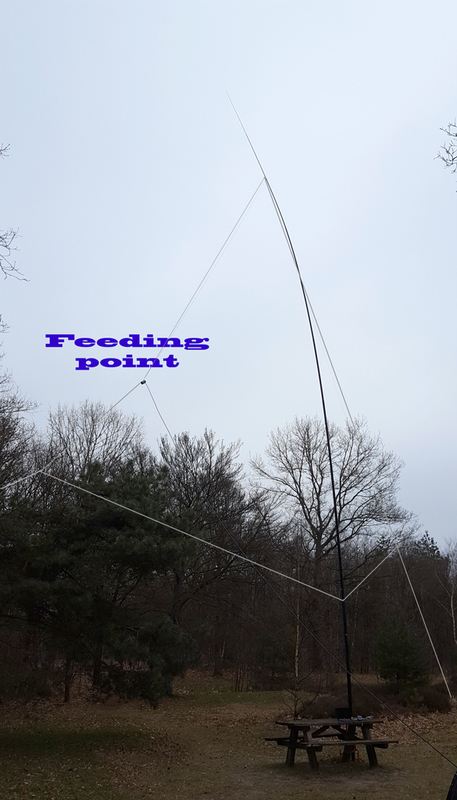 The antenna does not need a lot of height to put up and looking at it from a /P operator, it is about as complex (or easy) to set up as an inverted V. So I decided I'd like to have one. I cut some DX wire to the right size for 1 wavelength on 7.1 Mhz. Then I created a 1/4 wavelength stub using 75 ohm RG-59. I never created a stub before but with the help of my miniVNA it was really easy to achieve the correct length. This morning I had some time to try the antenna out in the field and tweak it to the correct length. So I went out to my favourite antenna testing field. I used my 18m SpiderBeam pole and pushed the apex to about 14m. The center was about 4m high. By pulling both corners to the side I was able to create a triangular shape. Note that I attached the top of the loop to the third element of the pole. Attaching it higher I would pull the top too far down. Checking the SWR I found I cut the loop too short - even though I had made it longer than the minimum length I calculated. So I added a bit of wire in the horizontal leg (as described by DJ0IP). I got the SWR dipping in the right part of the 40m band and still had a bit of time left to test it on the air. WPX contest meant the band was filled with signals. Most of them were from the EU as I was nearing local lunch time. I did hear ZL4 peaking s7 outside the EU bandplan and I copied TI5 buried in QRM. So it did seem the loop was receiving signals. I tried TI5 (new one on this band) but I just could not copy him well enough through all the EU splatter. I also heard AJ4A in KY and he was able to copy me. Not a new DXCC but KY is the furthest I have worked into the US on 40m. So it seems the loop works both on RX and TX. It needs a lot more testing to claim that it beats any of my other 40m antennas (inverted V, efhw, c-pole) but it starts out promising. I did notice the antenna is very sensitive to height above ground (DJ0IP already warned me about that). So I added this feature to be able to tune the antenna quickly when using it again.